Which contender has the best features and performance? Asus' new contender goes up against the old champ in this battle of the hybrids. The Transformer is made of aluminium, anodised with a sparkling finish and chamfered edges. It looks and feels like a traditional laptop. When folded, it's super-thin, and it's also light – though it fattens up when you attach the keyboard. The hi-res version comes with an impressive 2,560 x 1,440-pixel display, which will bring your movies and games to life. You only get a paltry 128GB of SSD storage, though, and its slim profile equates to micro-sized ports. Thanks to Intel's impressive Core M processor, this hybrid will handle most tasks, whether editing images or streaming 4K video. Eight hours of battery life is claimed, though T3's rigorous testing found the true figure to be half that. It comes with a real keyboard that's connectable via Bluetooth. This enables you to use the screen in a variety of circumstances where you wouldn't be able to if the keyboard was attached. There's no stand, though, which is inconvenient. Wrapped in a magnesium shell, it feels premium. It's thin and light, while upper vents dissipate heat. The Windows home button is on the left side of the glass bezel, so it appears on the bottom of the slate when held upright. Its 12-inch, 2160 x 1440-pixel screen is sharp and displays more content due to its 3:2 aspect ratio. There are five USB ports, Gigabit Ethernet and more. It also has an accurate pen for on-screen writing and drawing. The Core i5 version offers Ultrabook power – ideal for movie streaming and light gaming. It gets a bit hot and rowdy when pushed to its limits, though. It's claimed that battery life is nine hours, but T3 found it capable of just under four, in mixed use. The optional £120 Type Cover keyboard is pricey but offers a lovely feedback, and a wider glass trackpad that clicks. A double hinge and strong magnet mean it's stable to type on, and the kickstand can be adjusted for any situation. 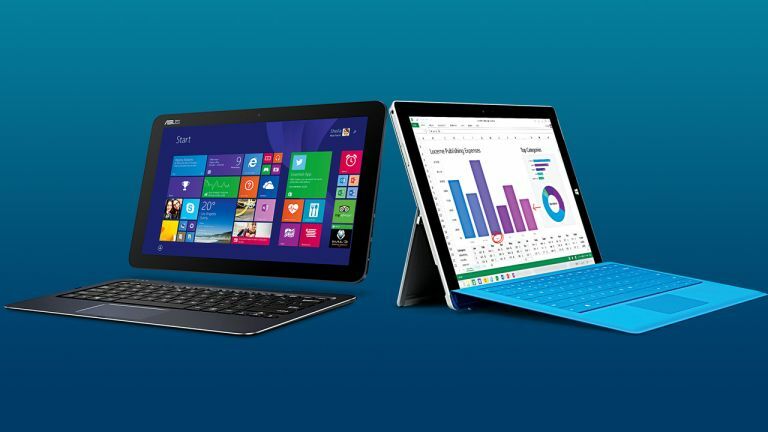 Best Windows 10 laptops, tablets and 2-in-1s: which one is right for you?